Hello all; hope you are having a good start to the new year. HERE IS A REPOSTED BLOG … written and recently posted by Michelle Andres on her site The Art of The Well Lived Life ~ Musings on Art, Life and the Art of Life … it is one that I think some of you, my readers, just might enjoy. Many people don’t understand abstract art. Truth is, there’s not so much to understand as to enjoy. Here’s a brief explanation for beginners …. Now, this could turn into an art history lesson – but I’ll do my best to spare you. I’m not an art history teacher and have no desire to overwhelm or confuse you. Okay, I like to confuse you a bit, but overwhelm, no. My main objective is to engage your curiosity and get you to perhaps look a bit longer, think a bit more openly and try to see art with your heart. While abstract art has been around for centuries, the formal movement sprung from the movements of Romanticism, Impressionism and Expressionism. Basically, the Church was the largest art collector of the day and they began to tighten the purse strings. Artists had to appeal more to private collectors and also got that itch, as they always do, to express themselves. So, rather than work within the confines of the church and society, these crazy artists began to colour outside the lines. They were scoffed at and considered renegades – in today’s terms – we would call them “fresh” and they would be highly desirable. So, I guess you could say, they peaked early, or they were before their time. 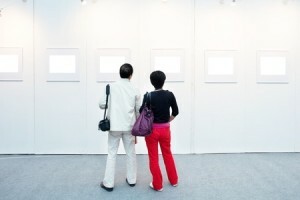 We all have our preferences for the types of art we like, but consider, when it comes to abstract art, you might be over looking some interesting, exceptional art under the guise of “not getting it.” Abstract art appreciation does not reflect your level of sophistication – but it does reflect your level of experience. In other words, you might have to look at a LOT of abstract art to recognize a good piece – but like wine – if you like it, that’s good enough. Appreciating abstract art is about pleasuring your eyes. So, how should we approach such art? This entry was posted on January 9, 2016 at 1:10 pm and is filed under Art & Life, Working as an artist. You can follow any responses to this entry through the RSS 2.0 feed. You can leave a response, or trackback from your own site.